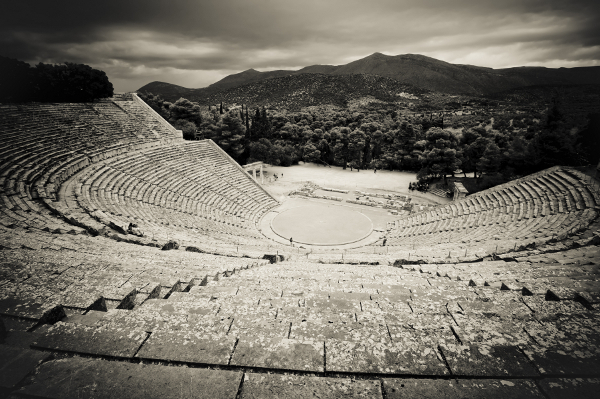 Epidaurus Theater - courtesy © javarman - Fotolia.com Epidaurus Theater - courtesy © javarman - Fotolia.com. The full moon of August is the brightest, and a catalyst for many rituals and gatherings around the world. When traveling in Greece the most publicized and popular events are the “Full Moon Parties” where clubs and beach bars hope that this cosmic phase will draw in the crowds, and those crowds will be wild. Personally I am not a big fan of the smell of stale beer and large inebriated crowds, which is why I want to present you with an option many people traveling to this ancient land are not familiar with. Let’s just call my introduction here, an opportunity to you fellow dreamers, to travel back in time. To a time when an oracle dance was a reality, and not from a movie script. Whenever I find myself outside the city at night, whether on a beach or in a forest, this land that sprung forth heroes, myths, and philosophy comes to life for me. It is then that I realize how this mountainous country, surrounded by water, set ancient minds to work wondering how it all came to pass. The clarity of the night sky, the sound of crickets, waves crashing; Odysseus himself about to burst out of my mind and walk up the beach, alas. The ancients were an urban people actually, and the city-states were the hubs of civilization, so the questioning mind asks, “how can we ever share their experiences?” The full moon of August is the one night when all the archaeological sites across Greece are open to the public, for one thing. The novice tourist will climb the Acropolis by the moonlight reflected on the marble it is constructed from, but for an authentic experience, leave the city behind, follow the myth. Cape Sounion, with the Temple of Poseidon is surrounded by the Aegean, the Theater in Epidavros (above), or even Ancient Olympia all make perfect destinations on this night; and the experience will leave the first time visitor spellbound, for the remainder of a lifetime. If real mystery, mysticism, and a rugged landscape is what you are after, there is only one place to visit by moonlight: The navel of the world, Delphi. 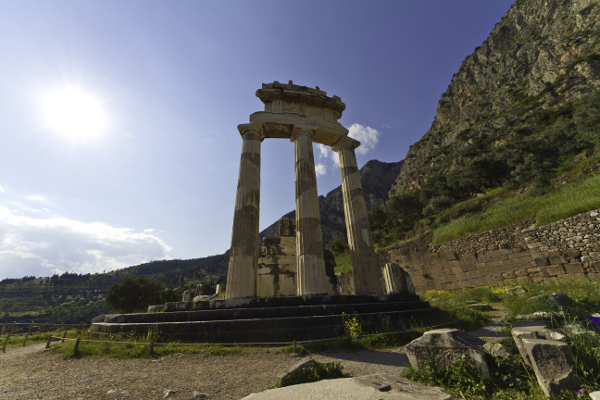 Everyone from citizens to kings used to make the pilgrimage to consult the Oracle at Delphi. Perched on the side of a mountain surrounded by a valley and a forest, the site of Delphi is a unique complex, and visiting it on this most auspicious of nights will add to the mysticism and magic already present there. So, the next time you are in Greece (of the very first time) and the full moon of August is out, forget the beaches and bars with the sweating heaving hedonism of the Greek party life, and add some magic to your cultural and mystic pocketbook. Trace legendary footprints in the sands of time – under the bright moonlight. Information about which sites are open can be seen at the site of the Ministry of Tourism and Culture.